Thank you for sharing this tender experience and your testimony of living apostles! They truly do represent our Savior. Great story! Gestures like that from our leaders are so meaningful. I had a stake president in Fort Wayne who would randomly call people (including me) just to check in, passed out little loaves of sweet bread at church, and even sometimes held interviews just to see how I was doing. It was one of the things that kept me from getting lost during those years. Yes, Brooke! I am so glad you read this and that you remember that experience! Loved hearing your experience Chelsea, I have always had a particular fondness for Elder Neal A Maxwell and the way in which he expresses himself so well through his words. My mission companion who had leukemia got a similar call from Elder Maxwell while in the mission field. Good to hear it wasn’t an isolated event. He was always one I admired and I miss his every-line quotability. That is absolutely beautiful! My great-grandpa is Pres. Benson. When he died, the apostles opened their homes to our ginormous extended family so we would all have a place to stay. My family stayed with Elder Perry and his sweet wife. I will always remember how kind he was to us. I have pictures with my grandpa, but no personal letters. That would be very meaningful. I know you will cherish that letter forever. Thanks for sharing something so wonderful. Elder Maxwell visited the Augusta, Maine Stake a thousand years ago (or so it seems now.) I had the privilege of meeting him, and I, too, wrote him a letter. At that time, my testimony was in the cellar and I said so in my letter. He not only wrote back, but he sent me a copy of one of his books, which he had autographed for me. He’s a very, very special man and one I hope to be able to sit down and talk with in the not too distant future. (I’m 72). Very Very Nice. Well said. Just like Elder Maxwell would do. 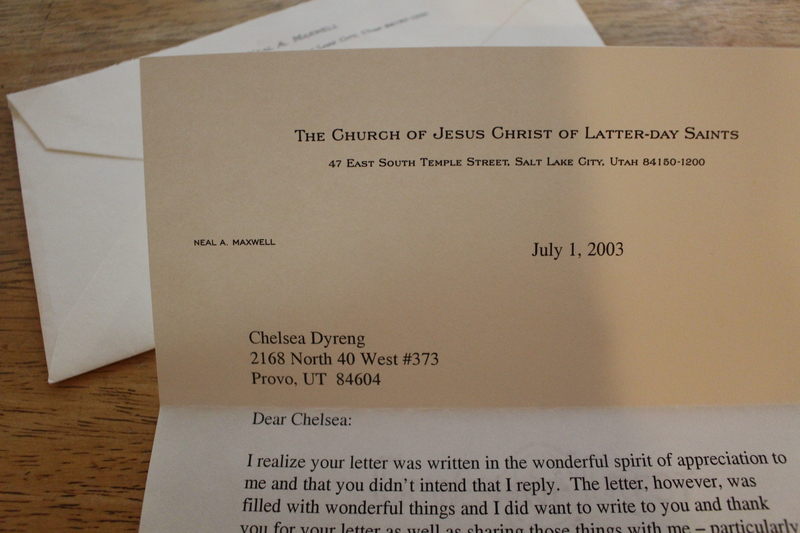 Thank you so much Chelsea for sharing your feelings and thoughts while also jogging our memories of sacred experiences with apostles. 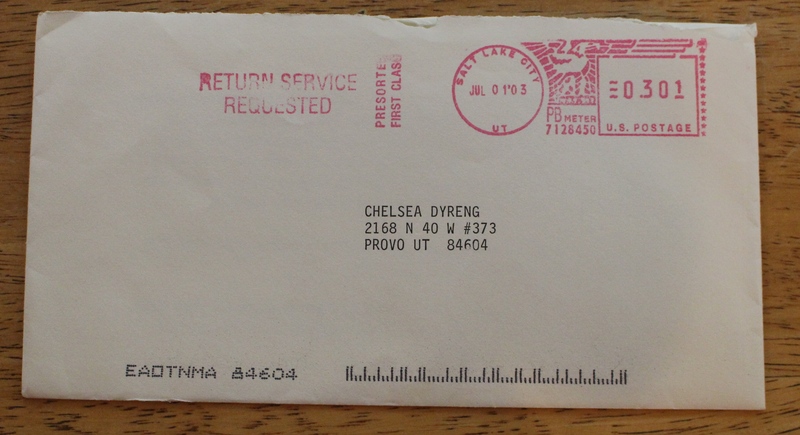 When my husband was to be released as Stake Pres. in Oct. of 2005. Elder Uchdorf was assigned to our stake. Prior to conference Dan had two sweet husbands come to him and ask if it might be possible to have Elder Uchdorf come into their homes to visit their home bound wives. Both were very humble and not wanting to be a burden, but felt the deep desire to lovingly have their wives receive edification this conference weekend along with the rest of the stake. My husband, Dan promised to relay the messages, but felt that he could make no promises based on time and scheduling. Calling a new stake Presidency requires many interviews and much time for extending calls and reorganizing a stake. Through the process Elder Uchdorf was told of these women and never hesitated in his desire to find the time to visit in their homes. One of the wives was a woman who had suffered with MS for many years and had been cared for by her loving husband and ward for a very long time. When Elder Uchdorf, Elder Phippen, and Dan knocked at her door she was not surprised, but was joyously pleased to have them walk into their home. She told them that she had been praying for this experience and knew that though she could not come to them, she knew that the Lord could bring them to her. The power of the priesthood was felt as she was surrounded and given a blessing from an apostle of the Lord. Faith did indeed proceed the miracle that day in her life. The next experience came as they visited the home of a woman who was in the final stages of cancer and was struggling to leave this life. That evening she was surrounded by family and the priesthood and was blessed with comfort and the ability to move forward. The miraculous healing came a few days later as she quietly left this life and entered into that sweet rest of the Lord, no longer burdened with a diseased body. In the weeks and months ahead this husband would share his gratitude in experiencing his wife being taken home through the gift and power shared while having an apostle in their home. Our stake was very blessed, not just by the words of an apostle of God, but by his Christlike deeds in fulfilling his divine role. We shall never forget! Thank you so much, Debbie, for sharing these wonderful experiences! Thank you, Midge for sharing those stories. Yes, they are great men! These experiences are just what I needed today! Thank you everyone! Wonderful. What a great story. I loved reading it. Thank you, D.T.! Thanks for the post. I was in tears because of the tender nature of this story and because of my own experiences with Elder Maxwell. I too, had a similar experience when my mom passed away back in 2003. She grew up in Salt Lake City right down the street from President Monson. He knew everyone in the neighborhood, and many years ago, spoke at her mother’s funeral. At the time she was married and living in Northern California, where I grew up. That funeral had a tremendous influence on my then-non-member dad, who many years later, joined the church. My mom had fond memories, and some of the same stories and poems quoted by President Monson. She was so very grateful that He also looked after her step brother in Salt Lake City, who was handicapped, and never married. Fast forward to 2003… I was caring for my ailing mom, and she passed away in the spring. We were all out making funeral arrangements. When we got back home, my nephew, who stayed to watch over the house, said “Oh, by the way, someone called while you were gone.” We asked who it was. “I don’t know… I wrote the name down on a napkin by the phone.” On the napkin was written: “Thomas Monson”. He was too young to really know who he had talked to! We were sad to have missed his call, but felt so blessed that our sweet mother had been honored by his call. Tina, that is a beautiful story! Thank you so much for sharing.